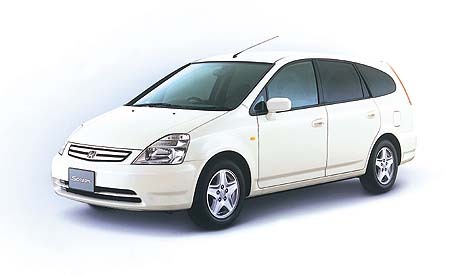 Honda has presented another new attractive family car following the former model "ODYSSEY." This two box car "STREAM" for maximum seven people is a compact type based on the famous "CIVIC." Today, "large and high back one box car" is so popular in our business and casual scene with its multi-purpose function, now being seen everywhere in the country. It has took the place of former family sedan and is showing off its dignity in town and the countryside. Yet, many of them carry just the driver. Designer and engineer of Honda have proposed the third sheet in "STREAM" as a space comfortable enough for two people to sit long, which is indeed a striking idea. Honda solved the problem many users have been confronting, and developed a new model with its own policy "man maximum, machine minimum." This idea is now being applied to new examples by other motor companies, which indicates one box car in the near future.